There comes a time in everyone’s life when the craving for hot, molten cheese hits. It’s why so many of us acquire fondue pots at one point or the other*. These cravings don’t just go away when you quit dairy! But I’m here to tell you that’s ok, you can have your cheese fondue and vegan too! *If you disagree, whatever it’s fine, just go along with me for the sake of this post! When it comes to cheesy flavors, sometimes there is no substitute for that cultured tangy flavor. 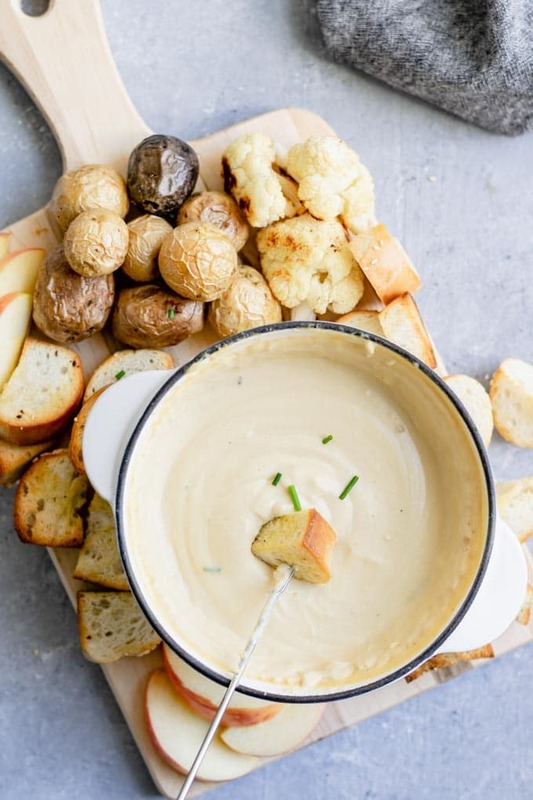 And that’s why for this vegan cheese fondue I’m going to walk you through the easy, if slow, process of culturing your own vegan cheese! It makes for layers of developed flavor in the final cheesy dip, with just the right level of funk. I’ve been culturing cashew cheese for over 5 years, and have figured a few things to make the process as fool proof as possible. While you can use any active probiotic to culture cheese including probiotic capsules, yogurt, rejuvelac, and even sauerkraut liquid, I find the consistency and ease of probiotic capsules to be the easiest to work with and that’s what I use to make the fondue cheese. When choosing your probiotic there are a few things to keep in mind. If you’re vegan, make sure they are veggie friendly capsules. You’re looking for active cultures (usually refrigerated), and want as many as you can find. I have used anywhere from 3 billion cultures per capsule to 10 billion cultures per capsule. It can have a variety of probiotic strains in it, but you want to make sure it includes L. acidophilus. Do not get a probiotic that contains any strains of prebiotics as this can prevent the culturing from occurring. I’ve used a few different brands over the years but find consistent results with Jarro Formulas brand, and some of their products are conveniently certified vegan, so look out for that symbol! 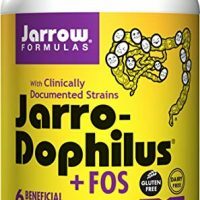 In the past year I’ve bought and used both Jarro-Dophilus with 10 billion per capsule and with 3.4 billion per capsule and have had success culturing lots of vegan cheese with both. When using the capsules with more live cultures, I use about half as many as it’s more potent. Probiotics are a bit expensive, but they’ll last you through many batches of cheese! Plus it’s always a good idea to take them for a healthy gut. You can usually find them at your natural health food store, but if not you can order them online (Amazon linked above). Once you have your probiotic on hand you can go ahead and start the process of culturing the cashew cheese. 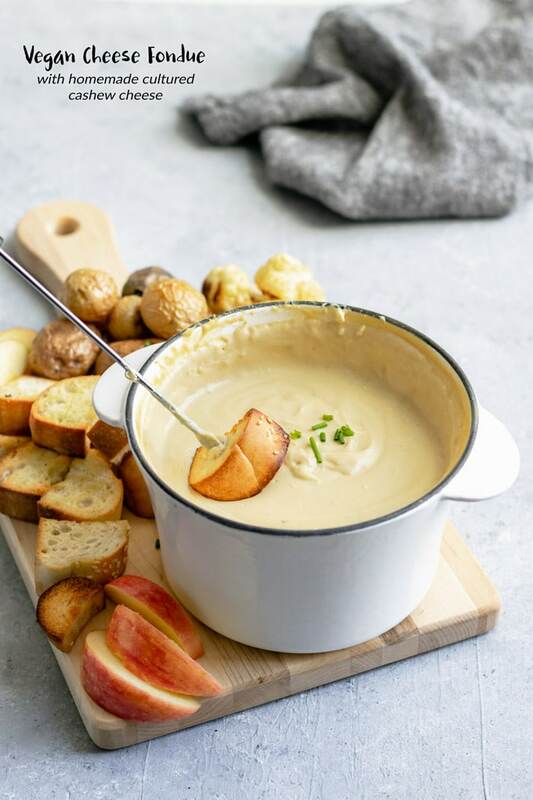 Keep in mind that culturing the cheese will take a minimum of 24 hours (unless it’s very hot in your kitchen then possibly it will take less time), so start the process at least 1 day before you want to serve the cheese fondue. Back when I lived in Chicago, I never had any difficulties with my cultures. It seemed like no matter what I could turn out deliciously fermented cheeses every time. I learned how to make vegan cheese from Artisan Vegan Cheese by Miyoko Schinner and she uses rejuvelac (which is a fermented liquid made from sprouted grains) to culture the cheeses. But when I moved to Washington DC, I started having hit or miss experiences with culturing cashew cheeses. Several batches of cheese went bad, and often times I wasn’t even able to properly make rejuvelac! Perhaps it’s the higher humidity of DC (I find food spoils faster in the fridge as well), but something in the environment changed that required a lot more finessing when it comes to culturing. But because of this, I’ve done a bunch of reading on culturing and have figured out some tips and tricks to make the process fool proof. Since implementing these steps I have yet to have a batch of cashew cheese go bad! Don’t worry though, if the cheese culture does go bad it is very obvious both by look and smell. Soak your cashews. Soaking your cashews in cold water softens them and makes it easier on your blender to turn them into an ultra smooth cream. I soak the cashews in filtered water to ensure that I’m not adding anything undesirable. This only works if you’re good about regularly changing out your water filters though! Use distilled water to blend with the cashews for the cashew cream. A gallon jug of distilled water is inexpensive and lasts a long time if you’re only using it to culture nut cheese. Sanitize everything that’s going to come in contact with the cashew cheese. To do this I boil a pot of water and rinse everything with the boiling hot water. This includes the blender–jug and lid and tamper (if you have a Vitamix), the bowl I’m going to culture the cheese in, any spoons or spatulas, the measuring cup, etc. Do not let metal touch the mixture once you add the culture. This means use a glass (/pyrex) or ceramic bowl to culture and mix the culture in with a wooden spoon or silicon spatula (the silicon spatula I use even has a wooden handle). Along with #4 I do not add the culture until after I’ve blended the cashew mixture. This ensures that the culture doesn’t touch the metal blades and also that it doesn’t heat up too much with the cheese as it blends. Following the above tips and tricks, blend your cashews with the distilled water, refined coconut oil for the richness and cheesy mouthfeel, nutritional yeast for cheesy nutty flavor, miso for it’s umami and rich cultured flavor, ground mustard seed for its sharp bite, and salt. 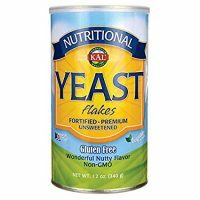 Pour the creamy resulting mixture into a glass or ceramic bowl and empty the powder out of your probiotic capsules into the cheese, mixing it in with a sanitized non-metal implement. Cover the cheese and leave it on your counter for at least a day. If you’re making bread from scratch in that time try to keep it far away from the bread making process as the bread yeast doesn’t always play well with the cheese cultures. That being said, I made sourdough bread every week and often at the same time as my cashew cream cheese and I’ve never had a problem. I just keep them across the kitchen from each other.. when I think of it. I’ll start tasting the cheese after 12 hours to see how it’s coming along. I’ll use a wooden spoon or silicon spatula to stir the mixture then scoop out a little to taste. Once it’s funky and tangy tasting to my liking, and it should be really tasty as is, I’ll stick the whole thing in the fridge. As it cultures the cashew cheese will thicken, and when placed in the fridge it’ll continue to thicken further. 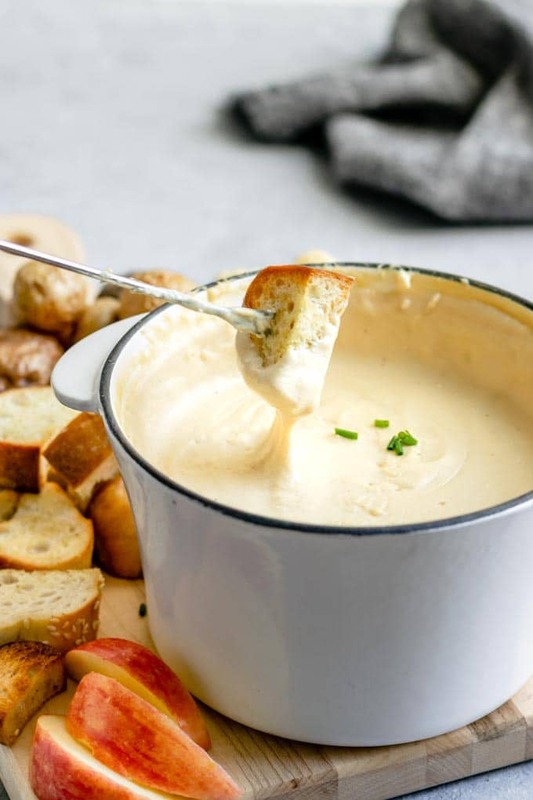 The cheese can be made for the fondue a week in advance, or can be turned into fondue as soon as you’ve hit your desired level of cultured flavor. At this point the process of making the fondue is really similar to the dairy version! Rub the inside of your fondue pot with a cut clove of garlic. Add the cheese, add some starch (we use tapioca starch for it’s stretchy qualities), and add lots of dry white wine. Warm it up over the burner and when hot and bubbling the starch will activate the the mixture will turn into a thick stretchy cheesy fondue. If you don’t have a fondue pot you can make it over the stovetop, either cook it over a low heat or even use a double broiler so you don’t burn your thick mixture. Then transfer it to a warmed serving dish (you can pour boiling water in the pot to warm it, then dump that out after a few minutes and add the cheese). And there you have it! Delicious cultured molten cashew cheese, ready for dipping all your favorite things into! Assuming your favorite things include some of the following: potatoes, bread, broccoli, cauliflower, apples, seitan sausages, parsnips, bell pepper, etc. 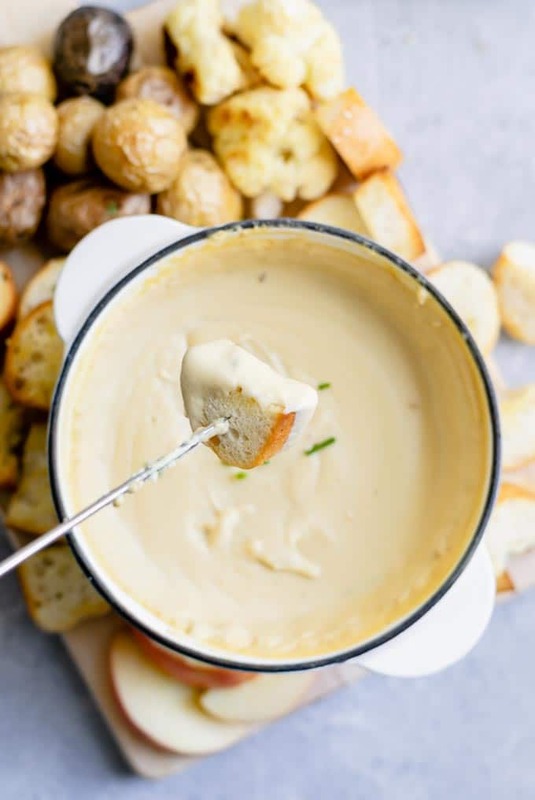 As long as we get some veggies in there, my husband and I are happy to call the cheese fondue a complete meal! It makes for a perfect intimate date night, though also works well for an appetizer at a larger gathering. As the recipe feeds 4 people (maybe 5, but who wants to be fifth wheel on fondue night–jk, probably everyone), it’s perfect for a double date! I hope I’ve excited you about the possibilities of making your own cultured vegan cheese! It’s really not tricky at all, and the steps are easy to follow. 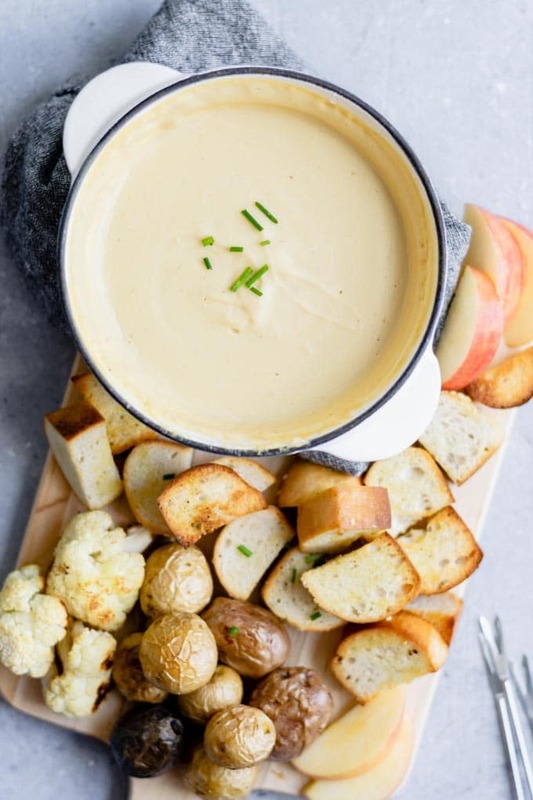 I’m such a fan of making my vegan cheese fondue, especially for cozy eating during the winter months. It’s something that would do really well at a holiday party or for fireside eating (is that a thing? whatever, we’ll go with it). 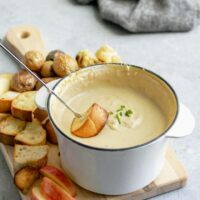 If you guys are into making this cultured vegan cheese fondue I’ll definitely share more cultured cheese recipes with you! Just let me know! If you make this fondue, or have any questions about making it, leave a comment below. If it finds its way onto your menu I’d love to hear about it! Share with me on Instagram, tag @thecuriouschickpea and #thecuriouschickpea, and rate the recipe on the recipe card below! LIKE WHAT YOU SEE? FOLLOW ALONG ON INSTAGRAM, FACEBOOK, AND PINTEREST. While other probiotic brands should work as well (as long as you follow the guidelines I outlined above), I haven’t tested all of them and so can’t guarantee results. I’d love if you reported back with any other brands that did or did not work for you! 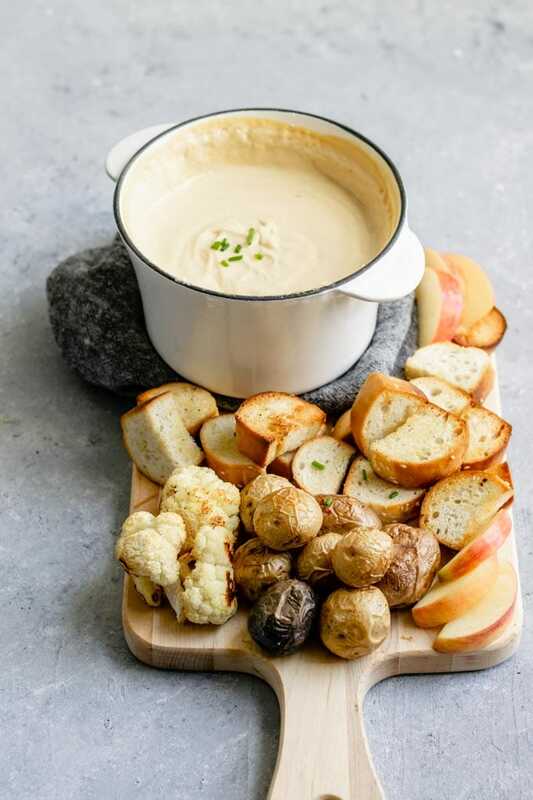 This indulgent tasting vegan cheese fondue is made with homemade cultured cashew cheese. Served with an assortment of roasted or steamed vegetables and cubes of toasted bread, it's a perfect intimate entree or appetizer for larger gatherings. First, sanitize everything that will be touching the cheese. Rinse your blender with boiling hot water as well as a glass or ceramic mixing bowl to culture the cheese, any measuring cups, and your spatula. No metal should come in contact with the mixture after the probiotics have been added, so get a silicon spatula or wooden spoon for stirring and sanitize that as well. Add the cashews to the sanitized blender along with the distilled water, melted coconut oil, nutritional yeast, miso, ground mustard, and salt and blend until very smooth and creamy. Transfer the mixture to a sanitized large glass or ceramic bowl (as metal can inhibit the culturing) and empty out 6 probiotic capsules into the cashew mixture. Stir these in with a sanitized wooden or silicon spoon and cover the mixture. Let it culture at room temperature for 24-36 hours, stirring once or twice part way throughout and tasting it as it cultures. When it reaches your desired level of tangy and sourness, put the mixture in the fridge to stop the culturing process. How long the mixture takes to culture can depend on the ambient temperature of your room. Rub the inside of a fondue pot or a pot on the stove with the cut clove of garlic and discard the garlic. Transfer the cultured cheese into a fondue pot or into a pot on the stove. Mix the tapioca starch in the 2 tablespoons of water to create a slurry and add that to the cheese along with the white wine and the nutmeg. Heat the fondue pot, or heat over the stove on low heat, stirring occasionally until the mixture is hot and bubbly. The cheese sauce will become thick and stretchy as the tapioca starch activates. Serve with your choice of foods for dipping. I love roasted vegetables, toasted bread, and slices of crisp sweet-tart apple. *I used 3.4 billion active cultures/capsule probiotic and don't recommend using anything with less active cultures. If you have a 10 billion active cultures/capsule probiotic you can get away with using 3 or 4 capsules. Most important: make sure your probiotic includes acidophilus in the culture and that it does not have any prebiotics as these can inhibit culturing. 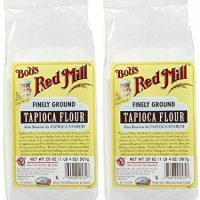 *You can substitute a different starch for tapioca (also called tapioca flour) but tapioca in particular has a stretchy quality when cooked. It’s Susana from Canada. I just adore all of your recipes; I look forward to each and every one of them with anticipation. I am so excited to try this fondue!! It is so authentic with the creative way of making it a “cultured cheese”. I like this version so much more than the other versions; I can see the flavor profile being so good with all the additional ingredients. I love that you have so many “cheese” recipes on the blog, which are creative. The quejo fresco is amazing. Thank you for all of the amazing hard work you do, in the very detailed steps that you give us so that our recipes are successful. Hi Susana, Thank you so much for the nice comment! It really made my day to hear that positive feedback from you! To answer your question about the wine, you can substitute vegetable broth for the liquid (a no-chicken style broth would be great here), and I would probably choose to add 1-2 tablespoons of fresh squeezed lemon juice (or more to taste) to brighten all the flavors. Wow, so impressed with this recipe reading through it – I”m super excited to test this out! The cheese sounds absolutely magnificent, and you’ve officially inspired me to start culturing my own cheeses going forward! Oh yay! Thanks Sunny! Culturing cashew cheese ends up being really straight forward once you get the hang of it! And it’s sooo much cheaper than buying it haha. If you have any questions about it I’m always here to answer them! thank you for replying back so quickly. Your suggestion to substitute the wine sounds perfect! I’ll let you know how it turned out when I make it. Thank you so much for sharing this amazing recipe! My daughter is alergic tô regular cheese and dairys. I will try this for her!